For a century and a half the words of presidents have framed, expressed, and sometimes challenged the civil rights policies of America. 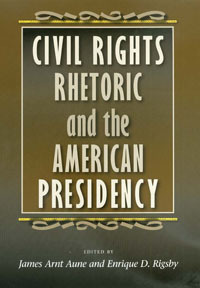 The eleven essays in this book examine the ways in which American presidents and their administrations have defined the meaning of civil rights from Rutherford B. Hayes to William Jefferson Clinton. • the efforts by conservative presidents to redefine the civil rights legacy in their own terms. The book's closing chapter analyzes President Clinton's 1997–98 Race Initiative and its failure, drawing conclusions about the role of presidential rhetoric in the near future of civil rights. Whether for individual enlightenment or for course use, readers will find the book opens new paths for exploring a central American dilemma. JAMES ARNT AUNE and ENRIQUE D. RIGSBY are both on the faculty of Texas A&M University's Department of Communication. They served as coordinators of the annual conference in presidential rhetoric devoted to civil rights rhetoric that led to this volume.